When I got home, I dug into the mystery of these stone stumps, discovering the profoundly insecure time before Americans had Social Security, when anxieties about death and finances ran deep in the American psyche. In response to these fears, the Woodmen of the World order and its progenitor and competitor, the Modern Woodmen of America, made life insurance approachable and fun by packaging it in the familiar fraternal-order culture of the day. The two Woodmen societies succeeded in selling fraternal insurance where others failed, thanks to their innovations, which included offering distinct tombstones, flaunting ax-twirling pageantry, and holding clandestine rituals that involved slapstick pranks and mechanical goat rides. Today, both organizations still exist as insurance companies, but they’ve shed the fraternal antics. It’s hard to imagine their previous incarnations, which resembled a combination of LinkedIn, GoFundMe, and Jackass. Death was everywhere in 19th-century America: Fatal injuries, disease epidemics, and the Civil War made families acutely aware of mortality. For women and children, the death of a husband and father could tumble them into poverty. Only the wealthiest Americans bought private life insurance. Women were not allowed to take out policies on their husbands, and if the husband bought the policy on himself, the money wouldn’t be protected from creditors. And then, grieving families faced another layer of shame. In 19th-century America, taking charity was seen as a sign of weakness: The thinking was, if a lack of industriousness made you destitute, well, then you got what you deserved. The middle and working classes did, however, have a workaround. Men could join secretive boy’s clubs like the Freemasons and Oddfellows that provided networking, entertainment, and a moral education. If a man proved himself to be hardworking and of good character through his initiation trials, his social standing meant his family could quietly receive financial support from the lodge without the stigma of accepting charity. After the devastating Civil War, well-established fraternal orders began to formalize their benefits into insurance subsidiaries. New secret societies known as “mutual beneficiary societies,” created with the explicit purpose of offering life insurance policies, sprang up around the United States. Largely excluded from the original fraternal orders, women and African-Americans even launched their own aid societies. Still, to join any fraternal order and receive its insurance benefits you had to prove that you were no slouch—a hard worker with high morals such as thrift, self-reliance, discipline, and generosity. But it wasn’t all about restraint. Before the days of TV, radio, or fantasy football, fraternal lodges offered plays, rituals, and camaraderie and allowed men to let loose, which kept members coming back for more. The clout of being an insider and the endless pursuit of mystical, esoteric knowledge ensured that men would make their insurance payments for decades to come. The payouts were between $1,000 and $2,000, a lot of money at the time. The Woodmen came late to the party—incorporating in 1883 as the Modern Woodmen of America—but their leaders’ entrepreneurial innovations breathed new life into the fraternal insurance game. Founder Joseph Cullen Root, a businessman in Lyons, Iowa, seized the opportunity to create his own fraternal order when the mutual aid society Knights of Honor, which almost went under because of the 1878 Yellow Fever epidemic, was selling its local lodge. 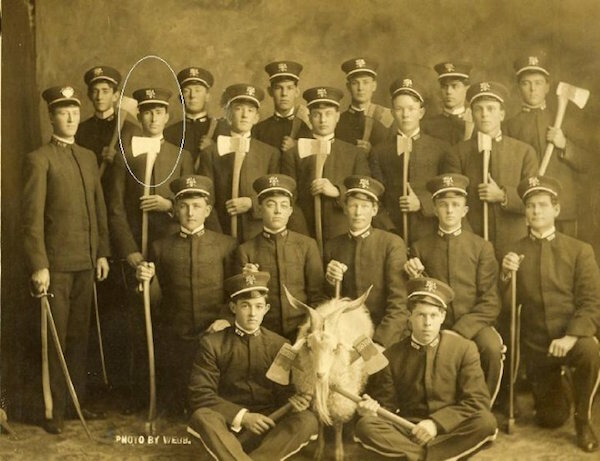 Wielding aluminum-headed axes, members of Modern Woodmen lodges formed marching units known as the Foresters that performed precision drill routines in military-like uniforms. Eventually, there were roughly 10,000 drill teams nationwide. Dave Lettelier, curator of the Phoenixmasonry Museum in Havana, Florida, says that such pageantry appealed to young men who’d grown up in awe of Civil War heroes. The fraternal beneficiary societies made signing up for insurance seem glamorous. After an internal dispute with the other Modern Woodmen of America leaders, Root left the organization in 1890 and moved to Omaha to form a nearly identical “speculative woodcraft” order: the Woodmen of the World. One of his innovations was to provide free tombstones—Root believed passionately that no member of his order should be buried in an unmarked grave. So for 10 years, the Woodmen gave its members grave markers in the shape of tree stumps, inspired by the Victorian Rustic movement. (For another two decades, the members put down $100 apiece to reserve theirs.) At a Woodman’s funeral, his personalized tombstone would be revealed in an elaborate ritual. The 4- or 5-foot-tall tree stump would be marked with the motto “Dum Tacet Clamet” (“Though Silent, He Speaks”) and rest on a stack of logs, each log symbolizing one of the deceased’s children. The local stone carver, who might alter the pattern, would add embellishments reflecting the Woodman’s personality, such as axes and doves. The Modern Woodmen took such rites to new levels. They’d challenge recruits to put their hands in (fake) molten lead. Others were subjected to spanking machines and collapsing chairs. The Ferris Wheel Coaster Goat, patented and sold by a company co-owned by Modern Woodman member Ed DeMoulin, would flip the unsuspecting rider upside down and fire blanks from its rear. Thanks to pranks like these—soon adopted by other societies—fraternal-order membership reached its peak or “golden age” in the United States between 1890 and 1930, with as many as one-third of American men belonging to at least one secret society. While that’s impressive, it still means about two-thirds of American families did without such a safety net. The Great Depression killed the fraternal insurance business in two ways. First, many men were unable to make their payments. Secondly, FDR’s New Deal created Social Security in 1935, filling the need aid societies once met. Radio, movies, and TV supplied the entertainment that the orders once provided. Woodmen of the World embraced these new media in Omaha, establishing a radio channel and a TV station—which launched the career of a local comedian named Johnny Carson—before both were sold to Meredith Corporation in 1958. Today, the Woodmen groups have become all-inclusive not-for-profit insurance companies: WoodmenLife in Omaha and Modern Woodmen Fraternal Financial in Rock Island, Illinois. Unlike for-profit insurance companies, they put profits back into their members’ communities with programs for senior citizens, people with disabilities, and orphans. “We still have an active Woodmen of the World lodge here in Waxahachie, Texas,” Webb says. “I’ve talked to them, and they said that they no longer do the different degrees. They meet once a month for a little banquet where they discuss their insurance premiums.” The goats, the costumes, and the rituals are long gone. , an associate editor at CollectorsWeekly.com, has written for Yahoo, Flavorpill, KQED, Jezebel, and the San Francisco Chronicle, among other outlets. Primary editor: Lisa Margonelli. Secondary editor: Jia-Rui Cook. *Lead photo courtesy of Lynne Adele and Bruce Lee Webb. Interior photo courtesy of Phoenixmasonry Museum and Library.